Pucker up! This is a naughty treat. 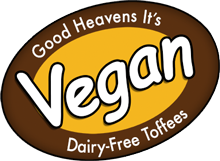 A softer toffee enrobed in our dairy-free alternative to ‘milk’ chocolate. This will bring back memories of a certain ‘chocolate cup of toffee‘, but you’ve never had a Smootch as good as this! Bigger, tastier, and naughtier than they should be – this is decadent bliss that’ll take you to seventh heaven. Each pack of 7 delights weighs 75g. Unrefined Sugar, Glucose Syrup, Margarine (Sunflower Oil & Vegetable Oils), Soya Milk, Golden Syrup, Lecithin (Soya), Salt, Vanilla Extract. Chocolate contains 42% cocoa solids, sugar, cocoa butter, soya flour, sunflower lecithin.